Description: Bethel College choir tour 1935; "Mary Virginia Stauffer & Florence Hiebert, Wisner, Nebr. 'Hatchery'--our hotel for that night." Description: Bethel College choir tour 1935; "Fastening the tarpaulin (canvas) to make a test for the girls to crawl under; Detroit Lake, Minn., night's lodging at tourist camp." Description: Bethel College choir tour 1935; "All in readiness to leave. People of the church are looking on with interest--just like they did most every place we went." 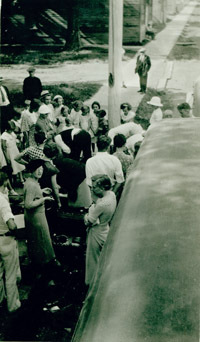 Description: Bethel College choir tour 1935; "Leaving the U.S. for a while; stopping at customs office to have all 'insides' of our baggage turned over." Description: Bethel College choir tour 1935; "Crossing the boundary into Canada (near Altona, Mani.) Sun. p.m. July 14, 1935. Customs office." Description: Bethel College choir tour 1935; "On the notorious 90-mile stretch after leaving Herbert, Sask., the Bus engine has to cool off a little. 'Them there clouds don't look so good to us. We need no more rain for the rest of this day.'" Description: Bethel College choir tour 1935; "Breakfasting at that so kindly & hospitable, rickety shanty after spent night in a one-room house (15 girls covering every available space of the floor) and the boys slept in the hay-loft of building on the picture." Description: Bethel College choir tour 1935; "Drinking cold water issuing out of the crevices on the side of the Mts." 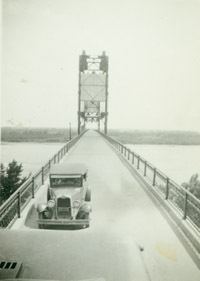 Description: Bethel College choir tour 1935; "Length of this bridge, near Newport, Wash., is over 2 miles." Taken from top of bus? 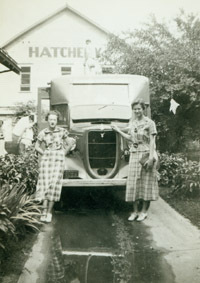 Description: Bethel College choir tour 1935; "Mose Stucky & Bus in front of our temporary home - 'Grammar School' bldg." Description: Bethel College choir tour 1935; "Tourist camp ground at Pacific Beach City, along the Pacific Ocean, out of San Diego, Calif."
Description: Bethel College choir tour 1935; "Near Bear Lake, up in Lake region, Estest Park, Colo."
Description: Bethel College choir tour 1935; "Wonder where that was!! I forgot." Description: Bethel College choir tour 1935; "No. 5; Just before leaving Birtle Lake, Man." 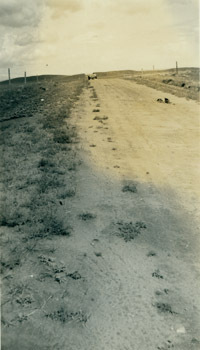 Description: Bethel College choir tour 1935; "Having left Herbert, Sask., on July 21, we encountered a long stretch of dirt (graded) road & a heavy rain. The bus is coming up one of the many hills after the boys pushed a while. Danger? Ask the drivers what they think about it. No. 11"
Description: Bethel College choir tour 1935; "Dorothy Claassen, Ruth Regier and Ann Voth--the 'sleeping beauties' in our Ford V-8. No. 13." 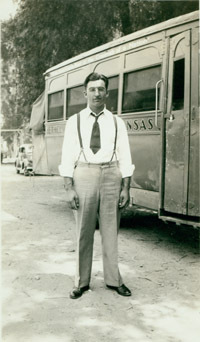 Description: Bethel College choir tour 1935; "'Old Faithful Pal.' Mose Stucky and his charge--the Bus, at Cucamonga, Calif., on the morning when Mose left us. His mother's condition called him home. She passed away Aug. 25, the day after we arrived home. No. 16"
Description: Bethel College choir tour 1935; "Gus in his Ford V-8, which performed so well during the 49 days in which we traveled, exactly 9,400 miles--in Ks., Nebr., S.D., Minn., Manitoba, Sask., Montana, Wash., Oregon, Calif., Arizona, Idano, Utah, Colo.--and, are there any states I forgot to mention? No. 18." Description: Bethel College choir tour 1935; "July 22, 1935. The day when we came back into the States. Like the three in the back seat of our car generally do, Verna Kaufman, Florence Hiebert, & Henry Voth are trying to get their 'beauty sleep'. No. 8."